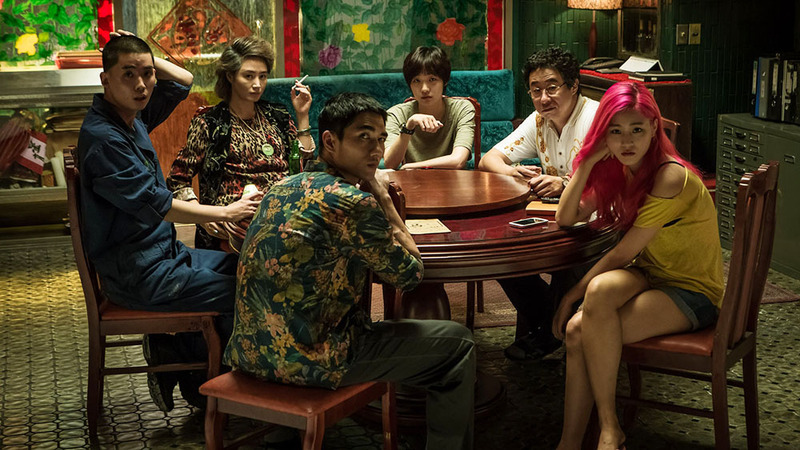 Mom (Kim Hye-soo, with cigarette) and Il-young (Kim Go-Eun, centre in khaki T-shirt) in Coin Locker Girl. The South Korean film Coin Locker Girl plunges us into a cruel and deadly world. It might not stand up to scrutiny, so don’t think about it too much, just go along for the ride. The coin locker girl of the title was abandoned in an Incheon coin locker shortly after her birth. She is not taken to the police, or a hospital, as you might expect, she is informally adopted by some homeless people. Is this an act of kindness or does her presence make begging a little easier? We never find out. Her story only really begins for us when a crooked cop scoops her up, stuffs her in a suitcase and delivers her to “Mom,” the tough boss of Ma Enterprises, in Chinatown. Someone remarks prophetically that no good will come of this. The little girl had been named Il-young after the number of the locker she was found in; in Sino-Korean il is one and yeong (or young) is zero. Talk about not having an identity of your own. As a child, Il-young begs on the subway with other young children who live with Mom. (We don’t learn their back story.) By the time she reaches her teens, she is a very tough, somewhat androgynous young woman (played by Kim Go-Eun), who collects debts for Mom. Woe betide the self-styled tough guy who does not take Il-young seriously and treat her with respect. She is quite handy with fists, feet, knives or ashtrays. Mom’s businesses prey upon people at the bottom of the social scale – illegal immigrants without papers, the poor, the gamblers, people with drug habits. If they can’t repay their loans, they might have to give up some body parts. Maybe most of them. But if the debtor cannot be located, a (healthy) relative will do. Furthermore, Mom does not hesitate to tell her employees that their continued existence depends upon remaining useful. The mother-daughter dynamic between Mom and Il-young is nothing if not complicated! Il-young has known very little kindness in her life; when a debtor makes her a meal and takes her to a movie it shakes her foundations to the core. The consequences are far reaching and violent. The Festival du nouveau cinéma runs from Oct. 7- Oct. 18, 2015.